So I wanted to make a quilt for the front door. And I had this idea in my head. But.... not everything turns out the way I hope it's going to turn out. It took me three days but I finished the little quilt and it's now hanging on the front door. While everyone else seems to like it, I'm still not sure I like it myself. I knew as soon as I finished piecing it that I had messed it up. I realized I should have made either the blues lighter or used darker greens. But once it was pieced it was too late to go back, so I just went ahead with quilting it. But you can see below how the top is too dark. It is totally made from scrap fabric, except the backing and it wasn't planned much except for the flying geese, the word HELLO and the grass vs sky. It was improv pieced. And it wasn't until the end I decided to add a piece of yellow for the sun. I used Sarah Fielke's "pinless curve" technique to cut and sew the curve between the green and blue. She teaches it in her Craftsy Class. And the text pattern is called Refrigerator Magnets by Elizabeth Hartman. I used her pattern but not her technique, I just sketched out the letters from the pattern and turned them into paper piecing patterns. 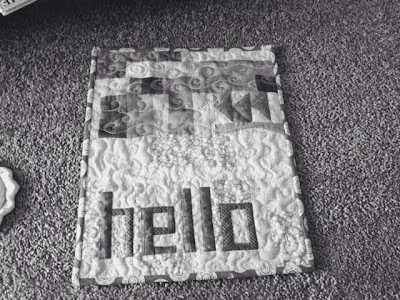 But hey that makes three quilts this year. 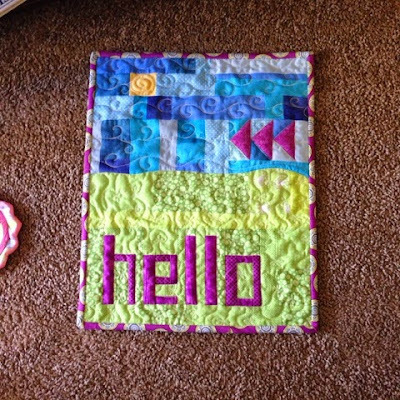 Not many, and two are minis, one is baby size, but a quilt is a quilt and I have completed THREE... with a baby in the house who requires my constant full attention, so I feel like that's quite an accomplishment!